In our store we have plenty of products with a children oriented theme, and in this section you will find concretely those related to new borns. Product Description: Button with a round shape, two holes, in pink color with carved flowers.Content: Price is per unit.Diameter: approx. 15 mm.Material: Plastic. Product Description: Decorative button with the shape of a mushroom in white and pink. To be used in scrapbooking, card making, crafts, patchwork and general sewing projects.Content: Price is per unit.Diameter: 18 mm.Material: Plastic. Product Description: Carved button in white color.Diameter: 12 mm.Content: Price is per unit.Material: Plastic. Product Description: Carved button in white color.Diameter: 11 mm.Content: Price is per unit.Material: Plastic. 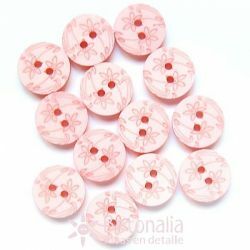 Product Description: Carved button in pink color.Diameter: 12 mm.Content: Price is per unit.Material: Plastic. Product Description: Carved button in pink color.Diameter: 11 mm.Content: Price is per unit.Material: Plastic.